This is easy to use, easy to apply and quick drying ( 3 minutes a coat). It's a lovely creamy red colour, not really an orange! I really like it. Noticed tip wear but lasted well otherwise. Lindas unhas, vermelho é atemporal mesmo. 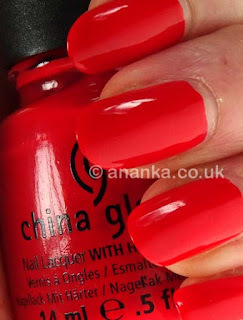 I think it's a little bit funny when the polish names don't match the colour :D Lovely red!! Where have you been, Ananka? I like such reds, they are cheerful. That color is fierce!! Love it. Yeah definitely looks more red than orange to me, but very pretty!